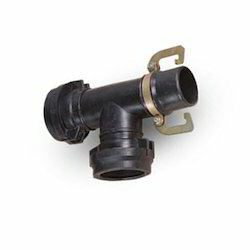 Our product range includes a wide range of hdpe sprinkler tee. We are renowned firm developing finest grade HDPE Sprinkler Tee. We are engaged in manufacturing innovatively designed tees for all kinds of sprinkler and irrigation systems. The offered tee is made from premium grade HDPE material and thoughtfully molded to meet the pressure specification in varied sprinkler systems. Further, our developed tee is best suited for its water efficient performance and hassle free connection. Designed with innovative ideas, the quality approved tee can be availed from us in varied sizes at a leading price.